Shop owner Jeff Binkley displays an AR-15 “Sport” rifle at Sarge’s Sidearms on Sept. 29, 2016, near Benson, Ariz. In a clear case of reverse racism, an obscure, little-known discipline called “science” has revealed that the vast majority of gun owners are uneducated white males who think black people are preparing to launch a sneak attack against the Caucasians any day now. A new article in Scientific American by Jeremy Adam Smith (yes, “American” is right there in the name, and the article’s by a white guy! That can’t be right) examined a variety of studies on gun ownership, including a 2017 study by sociologists at Baylor University. Titled “Gun Culture in Action,” the researchers created a “gun-empowerment scale” to study the habits and create a profile of the average gun owner. After studying a representative cross section of gun owners, researchers found that the people who have an emotional attachment to their guns were 78 percent white and 65 percent male. 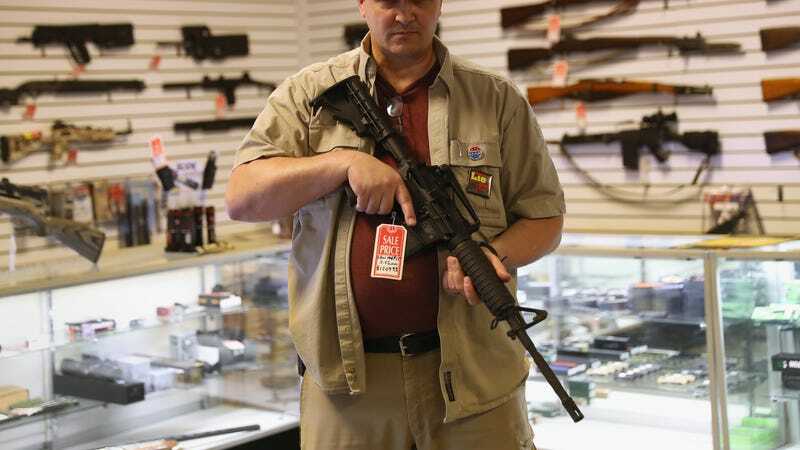 It must be noted that the sample size was small because—despite widespread American gun ownership—just 3 percent of the population owns half the guns in the country. Racial anxiety was a big reason for the uptick in gun ownership, according to Angela Stroud, a Northland College sociologist. Stroud went through concealed-weapon applications in Texas and interviewed applicants. She found that many of them wanted to protect their loved ones during the impending race war. ... Stroud also discovered another motivation: racial anxiety. “A lot of people talked about how important Obama was to get a concealed-carry license: ‘He’s for free health care, he’s for welfare.’ They were asking, ‘Whatever happened to hard work?” Obama’s presidency, they feared, would empower minorities to threaten their property and families. They are less educated: According to Pew Research, about 26 percent of white college graduates own guns, compared with 40 percent of high school graduates and 42 percent of people with some college education. There is no significant difference in the rate of gun ownership across educational attainment among nonwhites. They are racist: A 2013 study shows that a 1-point increase in the index they used to measure racism increased the chance of gun ownership by 50 percent. They are mostly Republican: Social Science Quarterly (there’s that word “science” again) reports that possessing a firearm increases the likelihood of voting Republican. They are not very religious: The researchers found that religious men often didn’t have the same attachment to firearms. The science indicated that most of these traits were not true when they examined nonwhite gun owners and women. Pew Research shows that a larger percentage of blacks have been threatened with a firearm or know someone who has been shot, but white men are more likely to say they need a gun for protection. And while most blacks find gun violence to be a problem in their community, most Republicans say more guns would lead to less crime. It’s the scary black people they worry about.